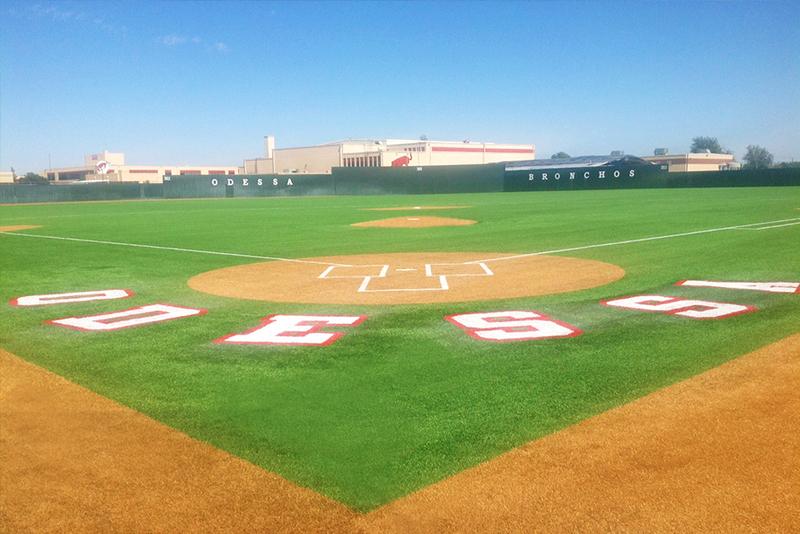 ECTOR COUNTY, TX (October 1, 2014) — – Hellas Construction has completed its Matrix® Turf installation at Odessa High School’s baseball field last week, offering Ector County ISD a long life, performance-enhancing surface that will reduce the district’s water consumption. Hellas is also finalizing the installation of a new synthetic turf baseball field at Permian High School, and is mobilizing to begin the construction of two synthetic turf softball fields at Ratliff Stadium. Hellas has been continuously present in Ector County over the years. In 2006, the school district selected Hellas to perform the track installations at Odessa High School, Permian High School, and the widely recognized Ratliff Stadium, home of the Friday Night Lights movie and television series. The Ratliff Stadium is considered to be the “Mecca” and the “Epicenter of Texas High School Football” since the 80’s. During 2012, Hellas completed field installations for the Bronchos and the Panthers, and worked on field event and tennis developments for Ratliff in 2013. All of the installations feature Hellas’ Matrix® Turf, a product recognized for its long life, temperature reduction, and traction-enhancing characteristics. Matrix® Turf is currently installed at venues such as the AT&T Stadium, Baylor University’s McLane Stadium, Angelo State University’s LeGrand Stadium, the University of California at Berkeley, and many more. The Matrix® Turf fields will also make Ector County ISD more efficient in terms of water consumption, and make it less challenging to comply with the water restrictions currently present in the City of Odessa. The Ector County ISD board approved the installations of new synthetic turf for the four fields in December 2013. Ratliff Stadium’s softball field turf installations will be the final phase of the project, and will commence during the first week of October. Headquartered in Austin, Texas, Hellas Construction is a nationwide contractor with a strong reputation for delivering premium-quality sports construction projects across the United States. Hellas has the ability to custom-manufacture and install proprietary brands of synthetic surfaces for field sports, running tracks, and tennis courts, by controlling all related operations. For more information, visit hellasconstruction.com, www.epiqtracks.com, and matrix-turf.com or follow them on twitter, and facebook. Ector County is a county West Texas, with its county seat set in Odessa. It has a population of 137,000, and the Independent School District carries a student count of over 30,000 students in more than forty-five schools. In addition to Odessa, the district also serves the communities of West Odessa, Gardendale, Goldsmith, as well as rural areas in Ector County. For more information, please visit www.ector-county.k12.tx.us.